This is a rather sad chapter of the investigation of the Sicilian Pseudophrys. 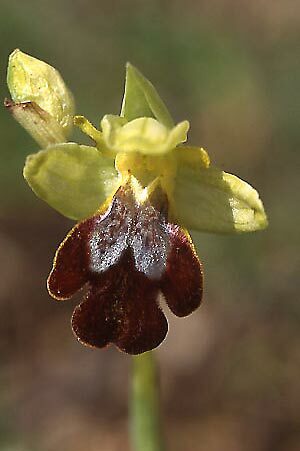 In 1988 Hannes F. PAULUS and Claudia GACK had found an orchid standing between Ophrys fusca and Ophrys lutea in several parts of Sicily, and so frequently, that it had to be a good species, and hybrids could be excluded. On page 176 of the book 'Ophrys Hybriden', which had been issued by DANESCH in 1972, they found four pictures of the same clan, which DANESCH had assumed to be hybrids between Ophrys fusca and lutea. In Sicily PAULUS and GACK couldn't find a pollinating insect, but when they transferred the orchids to Monte Pollino in Northern Calabria, males of the bee Andrena florentina were attracted, and males of Andrena thoracica to a certain degree, too. For that reason they gave the provisional name 'florentina-fusca' to the orchids. In Jber. naturwiss. Ver. Wuppertal 43 (1990) they reported it, and showed three black-and-white photos of the orchid. I don't know why PAULUS and GACK didn't continue to work on this Sicilian Pseudophrys in the following years. Ten years later in 2000 DELFORGE in Natural.belges 81 (Orchid. 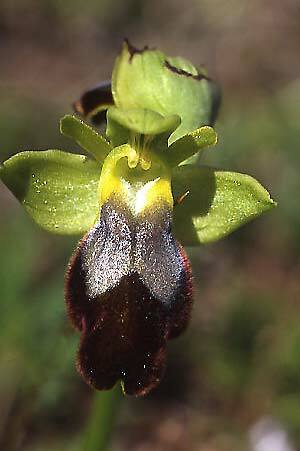 13) described an Ophrys clan between fusca and lutea as Ophrys flammeola (which are not the orchids shown below). I'm sure that this is 'florentina-fusca'. But from several suppositions DELFORGE constructed his arguments, why his Ophrys flammeola could not be 'florentina-fusca'. He argued, 'florentina-fusca' would be a heterogenous mixture of up to four different species. Indeed DELFORGE also assumed Ophrys flammeola to be part of 'florentina-fusca', but he asseverated, that at one of the sites mentioned by PAULUS and GACK he had found an orchid matching to the characterisation given by PAULUS and GACK, and this orchid he assumed to be 'florentina-fusca'. On the page mentioned above of DANESCH's 'Ophrys Hybriden' book he suspected fig. f to show the species Ophrys archimedea, which he also described in 2000, but I think that all four pictures of hybrid-like Ophrys on that page are clearly showing the same species Ophrys flammeola. No concrete reason he had for the suspicion, that PAULUS and GACK had possibly Ophrys laurensis, which up to now has only been found on Monte Lauro near Buccheri, counted to their 'florentina-fusca', too. In 2004 DELFORGE in Natural.belges 85 (Orchid. 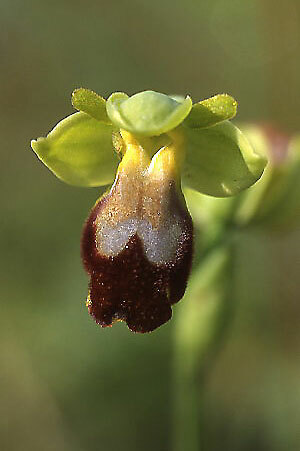 17) described the orchid, which for him was 'florentina-fusca', formally as Ophrys gackiae. This kind of orchids are shown below. In this article he repeated his suppositions and suspicions from Natural.belges 81 on the heterogenous composition of the 'florentina-fusca'. 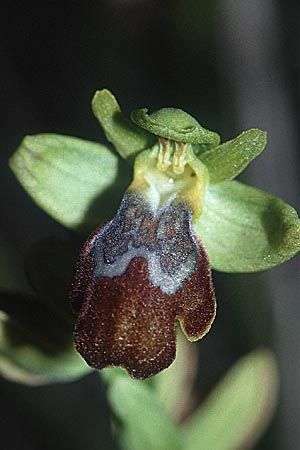 But as you can see below, Ophrys gackiae has no touch of Ophrys lutea, and DELFORGE himself didn't assign it into the 'subfusca group', but into the 'funerea group' in the second edition 2001 of his field guide. PAULUS and GACK however had accented the intermediate character explicitly, they had showed corresponding pictures, and had referred to corresponding figures in the DANESCH book. So DELFORGE's Ophrys gackiae can't be the 'florentina-fusca' in sense of PAULUS and GACK. 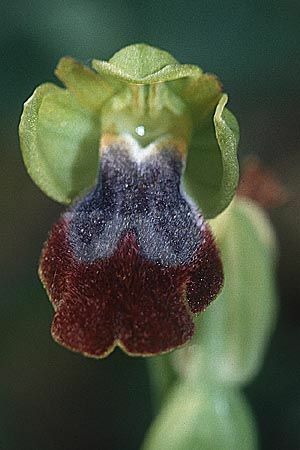 As usual at his descriptions of species, DELFORGE didn't name the pollinator of Ophrys gackiae. That DELFORGE choose the orchid's name according to Mrs GACK, leaves a feeling like scorn after this pre-history. 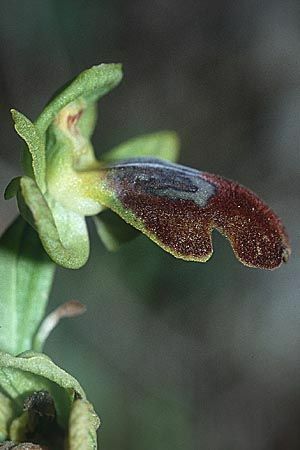 Ophrys gackiae has a labellum of medium size. Often it carries a rather tangled pilosity.